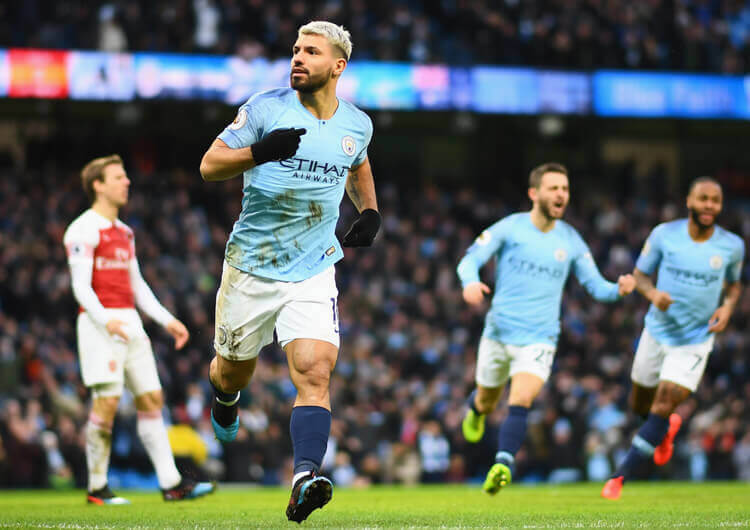 Manchester City moved back to their preferred spot at the top of the Premier League with an ultimately comfortable victory over Everton at Goodison Park. The champions were again short of their scintillating best, but still dominated possession against hard-working opponents determined to show improved form on the back of some disappointing results. Marco Silva’s men lacked a real cutting edge in attacking areas, however, and fell behind late in the first half when Aymeric Laporte rose to head home a David Silva free-kick. Having struck late in the opening period, City repeated the feat in the second half – Gabriel Jesus doing the honours to secure the three points that sent City above Liverpool, who have a game in hand, on goal difference. Marco Silva set Everton up in a 4-2-3-1 structure, with wide attackers Theo Walcott and Bernard providing attacking width behind central striker Dominic Calvert-Lewin. Full-backs Lucas Digne and Jonjoe Kenny moved high to support them, meaning that Everton’s wide build was largely vertical; it rarely allowed the wingers to receive passes facing forward and run at their man. Central number 10 Tom Davies supported the ball within the right inside channel, either opening up third-man combinations or giving Walcott time to readjust his body shape, receive once more and then attack Aymeric Laporte one on one. Andre Gomes moved higher, from the left side of the hosts’ double pivot, to replicate Davies’ position on the right. This allowed Bernard to move into better attacking positions on the left flank. That said, Everton struggled to progress into the attacking third. With Calvert-Lewin isolated up top and the central-midfield trio dropping deeper, Manchester City’s back line naturally squeezed higher. As they moved up, they also narrowed, leaving some spaces in wide areas for Walcott in particular to attack on the Everton right – but he only had Calvert-Lewin and Bernard to aim for in the middle, with subsequent corners or second-phase attacks the hosts’ best hope of breaking through. Having fallen behind late in the first half, Everton increased their possession in the second thanks to more assertive pressing against the City defence, which in turn helped them win the ball back in more advanced areas. Davies dropped deeper with the arrival of Gylfi Sigurdsson for Andre Gomes. The Icelandic midfielder gave the hosts more direct passing and running between Man City’s lines, but they were still unable to create anything of real note and have now lost three of their last four league games. Out of possession, the hosts mostly used a 4-1-4-1 formation in a mid-block. They focused on blocking off City’s central access, with the midfield zonally screening and sliding to block forward passes rather than directly man-marking their opponents and leaving themselves vulnerable to quick rotations and movements. 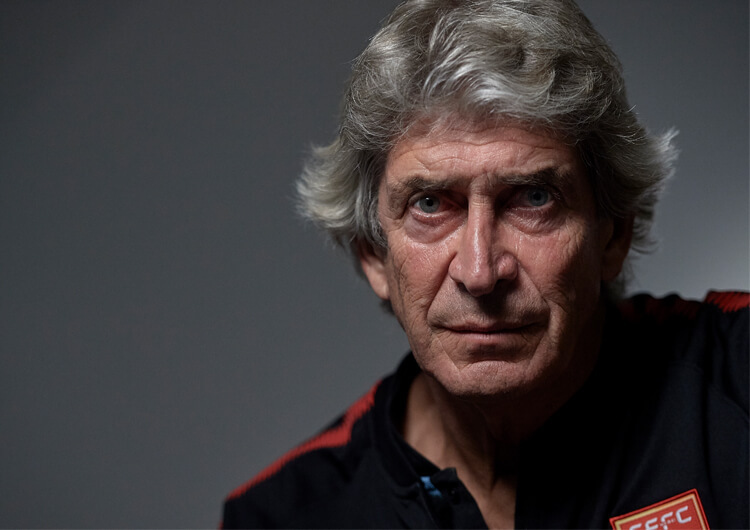 They did adopt a man-marking structure in their back line, often following Sergio Aguero as he dropped short, or David Silva as he made penetrative runs from their inside left channel. 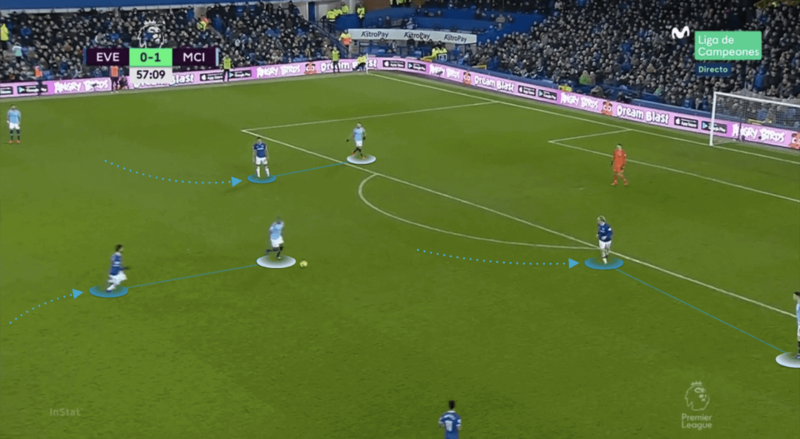 Although this initially meant that the visitors’ central link-up play was ineffective, quick switches of play to the opposite side – usually Everton’s right – proved problematic. In the end, the hosts conceded from a routine free-kick, with Laporte rising highest for the visitors. 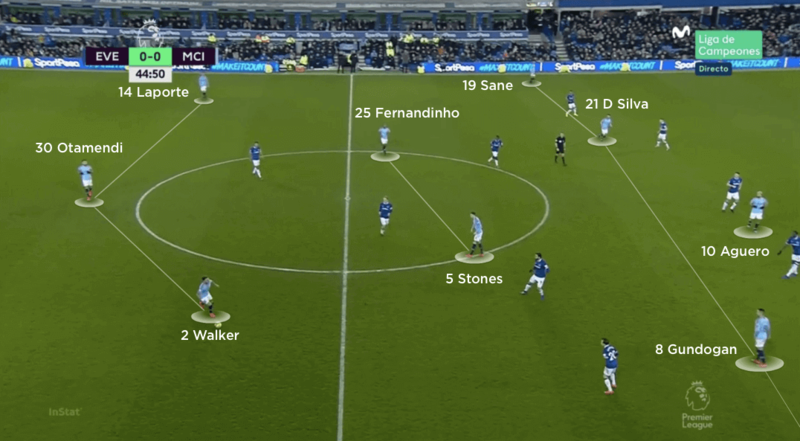 When Man City moved into their 3-2-4-1 structure in possession, Davies stepped higher to help Calvert-Lewin block off the double pivot of John Stones and Fernandinho. 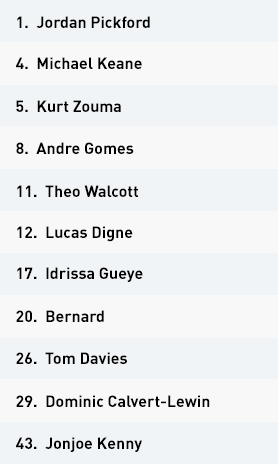 From here, Idrissa Gueye would also step into a higher midfield position, with Everton now resembling a 4-4-2 defensive mid-block. This reduced the visitors’ ability to dominate the central lane and certainly contributed to Everton’s increase in possession in the second half. Unfortunately for the hosts, City substitute Gabriel Jesus struck late to secure a clinical victory for Pep Guardiola’s men. Everton lined up in a 4-2-3-1 attacking structure, in which both their wingers and full-backs moved very wide. This reduced the passing angles available for either Theo Walcott or Bernard to receive facing forward, making it harder for them to turn and run at their markers. The hosts utilised a 4-1-4-1 defensive mid-block out of possession, with Idrissa Gueye dropping in between the midfield and defensive lines. This gradually deepened as Manchester City dominated the ball. Everton were much more assertive against City’s deep build in the second half. 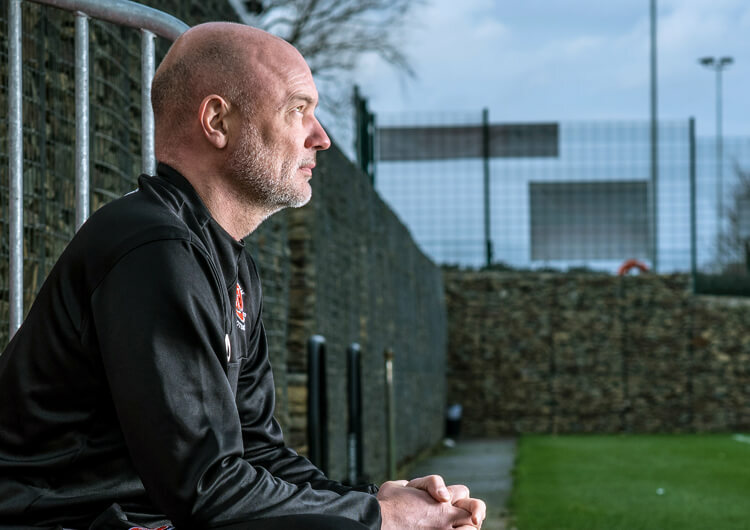 This enabled them to win the ball in much higher areas than they managed in the first, although ultimately they created little from these moments. 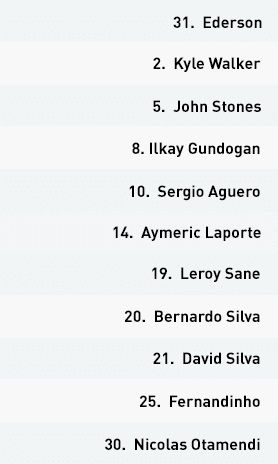 After starting in a 4-3-3 formation, Manchester City eventually shifted into the 3-2-4-1 structure they used against Arsenal. John Stones stepped into the double pivot alongside Fernandinho, creating more passing options into David Silva and Ilkay Gundogan. The visitors used a 4-1-4-1 mid-block defensive strategy, which continued even after Stones stepped into midfield in possession. 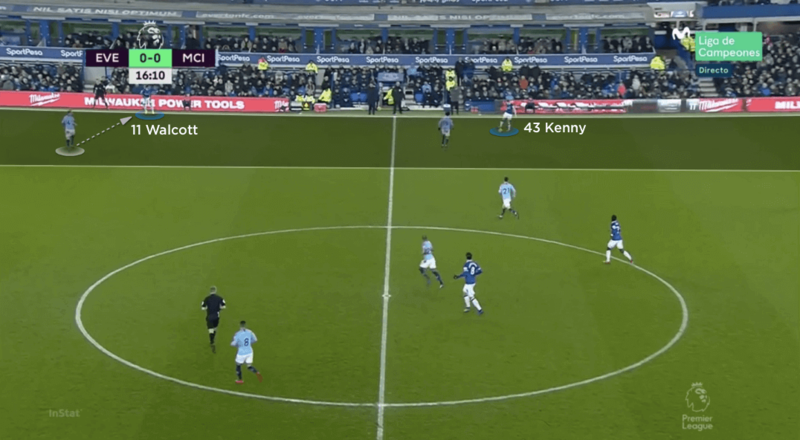 Everton’s 4-4-2 block covered the visitors’ double pivot, forcing them into less productive and more direct longer passes into the likes of Sergio Aguero and David Silva. 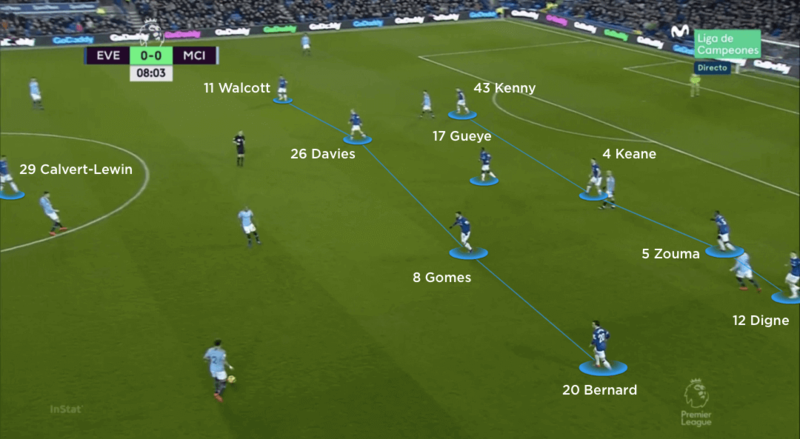 Pep Guardiola initially set Manchester City up in a 4-3-3 offensive structure, but attacked asymmetrically around Everton’s centrally compact mid-block. 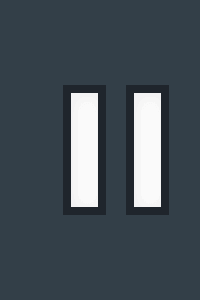 On the left, winger Leroy Sane occupied the wide area, but on the right the width came from right-back Kyle Walker rather than Bernardo Silva. Central forward Sergio Aguero also shifted to the right, occupying a central defender so Everton were unable to double up on Walker in advanced areas.  Attacking central midfielders David Silva and Ilkay Gundogan made penetrative forward runs in between Everton’s centre-backs and full-backs; these went largely untracked, as the hosts’ midfield marked zonally rather than man-to-man. As a result, the Everton full-backs repeatedly had to deal with two players; if the ball went out to Sane on the left, David Silva would make a blindside run towards the corner of the penalty area – from where he crossed for Gundogan to strike his shot against the crossbar. 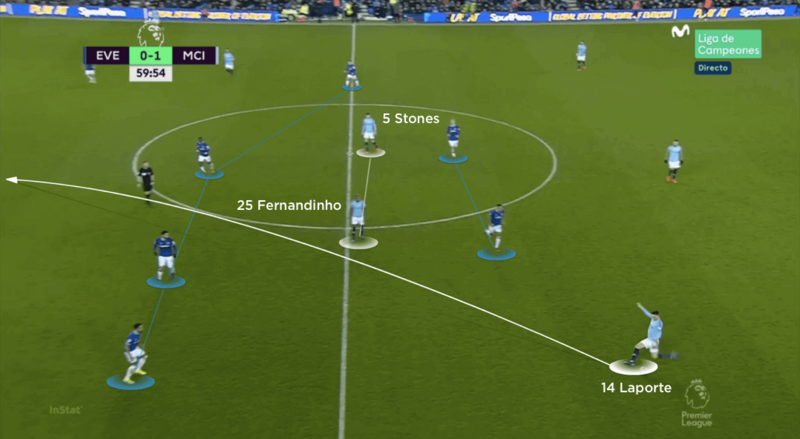 The visitors soon adapted into a 3-2-4-1 attacking structure, with central defender John Stones moving forward into the double pivot alongside Fernandinho. 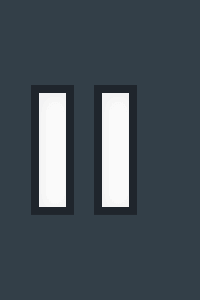 This opened up more passing lanes into David Silva and Gundogan between Everton’s lines. 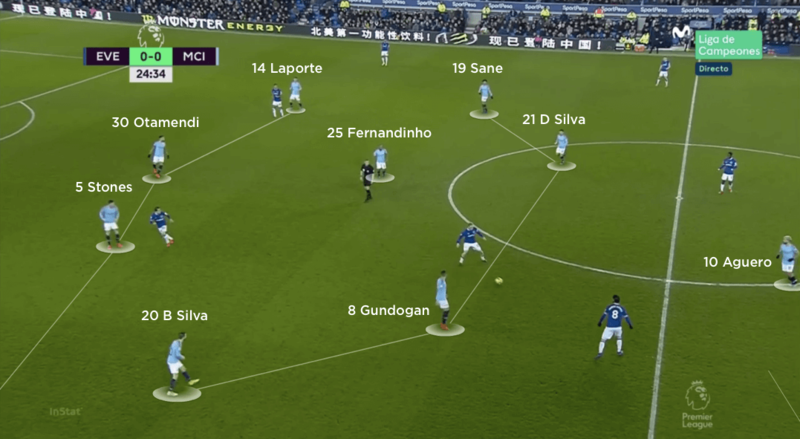 Everton moved into a defensive 4-4-2 shape in the second half, against which City struggled to connect with their advanced midfielders. Both Stones and Fernandinho were blocked off in midfield, which meant one of the back three needed to come forward in possession or play balls in behind for runners – but none of Nicolas Otamendi, Walker or Laporte convinced in possession, making it difficult for Aguero to find good possession in between or behind Everton’s compact lines. City still had the individual quality to create half-chances, mainly through the work of Aguero, David Silva and substitute Raheem Sterling. Their second eventually came deep in added time through another replacement, Gabriel Jesus, securing the win that saw them go top of the Premier League for the first time since December. Without the ball, the visitors adopted a 4-1-4-1 defensive structure, with both full-backs aggressively pressing Everton’s wingers. The structure proved incredibly effective, forcing the hosts to sacrifice Tom Davies’ central position between the lines in a bid to gain any form of useful possession. Even when Everton did manage to produce some form of cross or penetrative ball into the penalty area, City’s back line was more than comfortable against Dominic Calvert-Lewin and any supporting runners. In the second half, City looked to put pressure on Everton’s ball-carrier, who was usually in a deeper position due to the positioning of their defensive block. The idea was to force Everton into early clearances or long passes into Calvert-Lewin – who made consistent diagonal runs into wide areas – rather than to pinch the ball high. As City now kept their full-backs deeper, they made quick overloads against Calvert-Lewin wherever he went, totally nullifying any Everton threat on the counter. In the end, they coasted to their 10th win in 11 games in all competitions.